Smaragdi pension is a very nice accommodation facility located on the picturesque square of Artemonas village (1 km from Apollonia and 6 km from the Nearest Sandy Beach). Smaragdi was built in 2001 in two separate buildings, according to traditional Cycladic architecture and is surrounded by a nice garden. There are eight Standard rooms (8 units) and three Superior rooms (3 units) which are nicely furnished and decorated and all have air-conditioning, TV, telephone, fridge, safe box, hair dryer and veranda some of which have a panoramic view of the surrounding villages. The Standard rooms are on the ground floor with garden view and/or courtyard view. 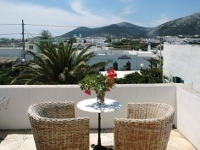 The Superior rooms are on the upper floor with panoramic view of the surrounding village. The pension also houses a cafe-restaurant which also serves breakfast. Free Wi-Fi Internet accessible throughout the premises. All accommodation units are also equipped with a wall-mounted PC socket.